Hope you all had a wonderful weekend. It was absolutely beautiful here in PA. the sun was shinning bright. A little chilly but nothing like we normally have this time of year and I'm lovin it. I would love to go the entire winter with no SNOW at all. Well that's enough about my weather let's move on to what I have to share today. It's another Shadow box card. (This is as close to snow as I want to get this year). 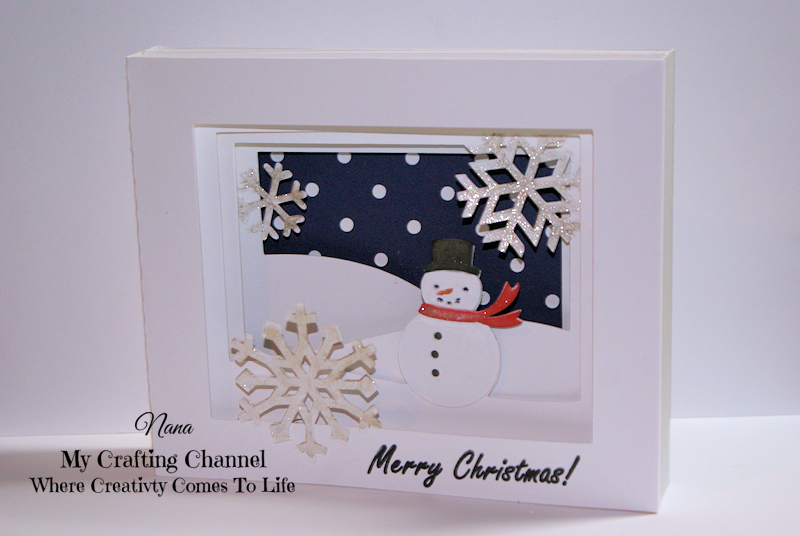 CARDZ TV CARD DESIGNERS CHALLENGE #7 "CHRISTMAS OR WINTER"
I love the shadow cards. This is beautiful. Adorable...I love this style of card...Pinning it to try and make one!! This is just Beautiful!! Love the adorable snowman!! Your shadow box card is gorgeous! The snowman is so adorable:) Such a unique card! It has been super mild here to which is really odd for MN. We are usually super cold and already lots of snow but we only have about 2 inches on the ground and temps in the low 40's so I am sure it will be gone by tomorrow~crazy weather! This is so beautiful such a pretty wintery scene I love it. Such a gorgeous shadow box card! The wintery scene you created looks amazing and the snowman is so sweet! I also love the sparkly snowflakes! This is such a sweet scene with the snowman standing among the hills with the glittery snowflakes falling down! Your box card is awesome, love the fun happy scene, great job on this beautiful design.Thanks for playing along over at DL.ART! What a beautiful wintry scene, this is just gorgeous! Love the snowman scene you made and all the sparkle. What a gorgeous card!! Love the snowman and the pretty glitter on the snowflakes!!! Have a great day.